Welcome everyone. I’m Ramon Mejia from the LitRPG Podcast. I bring you the latest LitRPG news, reviews, and author interviews. 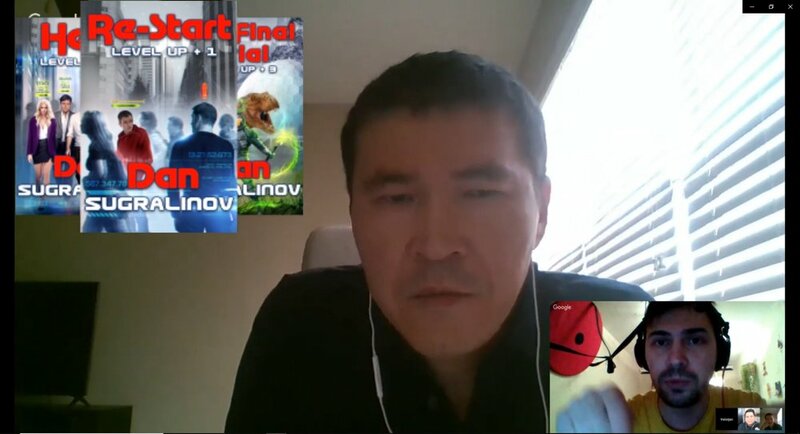 This week I’m talking to one of your favorite Russian authors. He’s the author of the Level Up! Series, co-authors the Knockout series, and has an upcoming new series called Class-A Threat (Disgardium Book #1). Also, note that Dan actually sent in written responses to all the pre-interview questions I sent him so you have the unique opportunity to read his answers. Even a few to questions he didn’t get asked in the video interview. I was born in the USSR in one of the fifteen Soviet republics, which is called Kazakhstan. My country is in 9th place in the world by territory. What about me, I'm forty years old, I'm married and raising a son. All my life I have been doing business in IT and web-development, until I admitted to myself that I want to be a writer. I have a master’s degree in economics and an MBA degree. I have an extensive gaming background. I can say I grew up in games. But most of all I played World of Warcraft — more than 10 years playing for the same character. My character is a worgen rogue from Alliance. During the Cataclysm, I even became the first in the world by Wowprogress. When I was 24, I wrote a motivational novel titled Bricks. For more than ten years, this book has more than 3 million reads. Two years ago, my mom had a stroke, and sitting near the intensive care unit, not knowing if she would survive, I thought about my life. And I decided that life is short, but I never tried to become a writer. The next day I started writing Level Up. So, tell me about your series? The idea of augmented reality isn’t new. The Google Glass project is in fact nearing its completion even as we speak. But the idea of digitized real-life stats, that’s a bit different. I had it in summer 2014. At the time, I was working hard trying to lose weight from my original “too-fat-to-tie-laces” 242 lb. to my current 175 lb. These days, I can’t even imagine my life without going to the gym. It was in the gym that I first realized how effective weight training could be. Today you lift 45 lb, a week later it’s 55 lb, and six months later, it’s already 175! Or, speaking in RPG terms, you level up Strength from 2 to 8. Then an idea struck me. What if we could see all these status bars, skills and characteristics in real life just as we can in MMORPG? It’s one thing to know you’ve learned something from a book — and it’s something quite different if you can clearly see that it’s added +2% to your Intellect. Or that a visit to a swimming pool gives you +5% to Stamina. Would that motivate you more? I’m absolutely sure it would. This is exactly why I’ve always loved RPG and LitRPG as well as weight training. Six years ago, I couldn’t do a single pull up. Now I can do fifteen easily. It’s the same in business: whether you work your backside off or just go through the motions, your company’s earnings are the only accurate barometer of your activity. I spent some time thinking about it until it all fell into a pattern. That’s when I came up with my main character Phil Panfilov and his story. I mapped out his development arc, added some key scenes, came up with support characters and started writing. That’s how I finished "Level Up. Re-Start", the first book in a series which tells the story of a gamer who’s been a bit too lax with his life. By the time he’s thirty-something, he has a wife, a string of one-off freelance gigs, a powerful computer, a level 110 rogue character in a popular RPG game and a beer gut. My new fantasy LitRPG series, Disgardium was voted the best Russian LitRPG release of 2018. Its English version is already available for preorder on Amazon. Alex is a fifteen-year-old student dreaming of a career as a space guide. He eats, sleeps and breathes stars — but life has other plans. That’s how Disgardium, a new online game, becomes his only means of reaching his goal. Alex is lucky enough to achieve what amounts to God mode complete with absolute immunity — but that’s only one side of the coin. As an imba player, he becomes a “global threat” — one of the few fellow wayward players whom the game company views as a danger to itself, paying a lot of money to the so-called prevention clans for their elimination. I think this book will never be translated into English. This is a very Russian book. The protagonist goes to work, suffers bullying by superiors and colleagues, has no friends, and he does not even have a girlfriend. Then something happens, and he decides that he does not want to live like this, and he needs to change his whole life. In addition to these series (Level Up and Disgardium), I finished the first book of another series this year, which I called the “Ninety-ninth World”, and also, together with my co-author Max Lagno, we have finished Level Up. Knockout. Book 2. Phil (Level Up!) — He is very kind. He used to be selfish, but he changed his mind, in beginning following by interface and after — by himself. Fifteen-year-old schoolboy Alex (Class-A Threat ) — He is very kind, too. Like Phil. But if Phil was drifting, Alex has a clear dream and goal — to graduate from the university to become a space guide. He is a teenager, and he is new to the game, and we explore both the world of Disgardium and the adult life with him. I need about two more weeks to finish my work on the second book of Disgardium, after which I will proceed to Level Up 4. Selection. Phil's adventures will continue, but I can’t tell you without spoilers — because you haven’t read the third book yet. Level Up and Ninety Ninth World in Russia are called RealRPG. Disgardium is a very classic LitRPG, setting is in a fantasy world with orcs, elves and dwarves. If for the Ninety Ninth World I was inspired by Fallout, then Disgardium influenced by World of Warcraft and Skyrim. I love reading and I love videogames. Especially RPG-games. This is the answer. A lot. Actually I do research on many things. For example, today I spent several hours researching martial arts just to choose a pair of new abilities for Alex in a second Disgardium book. It seems I have already answered this question. Too many names to list at least a part. I have read and read almost all the books in literg in Russia, but since childhood I have a great love for Stephen King, Robert Sheckley, Kurt Vonnegut, Eric Frank Russell, Pierce Anthony and Robert Asprin. Of the more modern ones, I really like George Martin and Joe Abercrombie. When I was 12 years old, I wrote a sequel to The Lord of the Rings. In the USSR, only the first two books were published at that time, and, dying of impatience, I wrote my version of “The Return of the King”. I will be honest. Books allow me to live the way I want. I managed a business for 20 years, and the opportunity to be with my family, raise my son, invent and tell stories is just a dream come true. And the money, of course. We all have to pay bills. As I said, since childhood I loved inventing stories. Any story requires a listener, and the book provides an opportunity to get thousands of readers. Since last summer — full time. At 8 in the morning I take my son to school and write until the moment when he should be picked up. But January-March of this year are very saturated. I will tell you in confidence that at the same time I am working on 4 projects, and I often make sketches in the evenings. It happens like this: I go to my son's room, we play some game together, but he controls the character, and I manage to write more than a thousand words during these 2 hours. Every day. But at the weekend, I usually just edit the text and think through the plot. Yes of course. The minimum plan is two thousand words a day. I use Chromebook for mobile writing — on the road, on the street, in the Universal Park, while my son plays in the children's area. Full work begins at home on my gaming laptop. But it happens, I write even on my iPhone. I don’t know. Ideas just come. When you started your series did you have a plan for where it was going? Did you plot out the whole series or just the first book? I have a global plan of ten to twelve pages for the entire series and a detailed one for the first book. The most difficult thing in writing for me is two things. Make yourself start and manage to stop. When I'm in the stream, I don't notice the time and can't even eat. Exactly a week ago, I put an end to the book Ninety-ninth World. But I still had so much to tell! It was difficult, and I wanted to continue the story immediately, but I cannot afford it. My readers are waiting for Level Up 4, and they are already demanding the third book of the Disgardium series. Three to four months on average. Nether. Maybe because I am a novice author. Try to get around the obstacle on the other side. Start writing on another topic, and in the stream go to the right. I love the series. I quickly read and really do not like to part with my favorite characters. I have been reading since I was 5 years old and I read several books a week. Ebooks on my iPhone. The reason is — all my books are always with me in my pocket. All of my books! Reality Benders, book 4 by Michael Atamanov. This topic is now being vigorously debated by Russian writers. Since I am from a new generation, but at the same time I grew up on paper books, I see advantages here and there. -Includes Audiobooks: Why did you decide to make audiobooks? Self publish? Use big company? How was that experience? It is a question of the Magic Dome. I just do my part of work — writing. I use LitRPG-communities. And that’s all. I have only one piece of advice. Write interesting stories about heroes that the reader wants to empathize with. Then the readers will do everything themselves with the promo of your book. Maybe an hour per week answering my reader’s question. What are your plans for the Level Up series? How long will it continue? Do you have other LitRPG novels that you plan to write? What inspired Level Up? It is unique as a real life LitRPG. Pat Drew: Ramon can you please ask Dan if - 1) he can work to get the English translations out faster. 2) If books 4 & 5 of Level Up will be focused on Phil or a difference character as Dan mentioned that Book 3 will end Phil's adventure in the 21st century or are Book 4 & 5 focused on Phil but in the future, maybe relating to the battle with the other races 3) Is Dan planning on a English translation of Bricks 2 & the new 99 World Series?